Rio Grande’s Payten Davis beats West Virginia University-Tech’s Veronica Nobles to the ball during the first half of Thursday night’s game at Evan E. Davis Field. Davis scored both of the RedStorm’s goals, including the game-winner with 1:44 left to play, in a 2-1 win over the Golden Bears. RIO GRANDE, Ohio — Reigning River States Conference Player of the Week Payten Davis scored her second goal of the game with 1:44 left to play and lifted the University of Rio Grande to a 2-1 win over West Virginia University-Tech, Thursday evening, in women’s soccer action at Evan E. Davis Field. Rio Grande improved to 5-7-1 overall and 3-3 in the RSC with a second straight victory. WVU-Tech, the top pick in the RSC preseason coaches’ poll, dropped to 6-5 overall and 3-3 in league play. Davis, a sophomore from Chillicothe, Ohio, gathered in a loose ball that was misplayed by a Tech defender and then maneuvered past Golden Bear net-minder Jenna Miller for a shot at an open net to snap a 1-1 deadlock. Davis had given the RedStorm a 1-0 lead just 3:37 into the second half, booting the rebound of a shot by junior Brooklyn Pritt (Scott Depot, WV) which ricocheted off the hands of Miller into the back of the net. 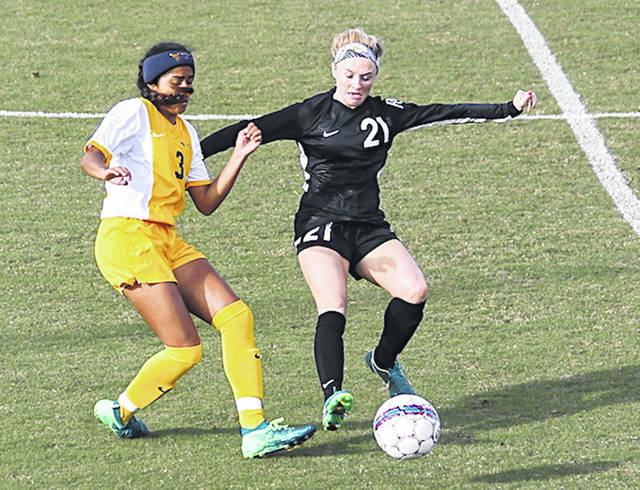 WVU-Tech tied the game with 14:11 left to play when Meghan Rugel took in a crossing pass from Lorena Moyers at the top of the 18-yard box and lofted a shot over Rio senior goal keeper Andrea Vera (Quito, Ecuador), setting up the dramatic finish. Each team managed just nine shots overall, while the Golden Bears finished with a 6-5 edge in shots on goal. Vera, who had missed the previous eight games due to injury, recorded five saves in her return to Rio’s starting lineup. Miller had three stops in the loss for Tech. Rio Grande returns to action on Saturday when rival Shawnee State University visits for a non-conference match.